The essence of this dish is in the marinade – the honey and sugar create an irresistible caramel effect, which even vegetarians will find alluring. 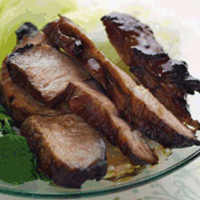 Combine the pork with the marinade ingredients in a large bowl, cover and leave to marinate in the fridge overnight. Next day, preheat the oven to 190°C/gas 5. Remove the pork from the bowl, place the reserved marinade in a small pan and simmer for 30 minutes to reduce and thicken. Place the pork on a wire rack inside a roasting tin, then fill with water to a depth of about 1cm, so that the meat is suspended above the water. Roast the pork for 15 minutes, then turn the meat over and baste it with generous amounts of the hot reserved marinade. Roast for a further 15 minutes, then baste again. Turn the oven temperature up to 220°C/gas 7 and roast the pork for 10 minutes. Remove the pork from the oven and allow it to rest in a warm place for 10 minutes. Cut it into slices about 1cm thick and serve it with steamed rice and stir-fried Asian greens. This recipe was first published in February 2007.